Plans are underway for our annual BVQ bus trip to Chantilly, VA for the Quilters Unlimited Quilt Show! News is out about our BVQ Annual Challenge! We have our work cut out!!! Our 2018 quilt show has ended! Thank all who attended! Our theme was to connect the Artistry of the Past with the Imagination of the Future. What do we imagine the future holds for quilting? Technology is already giving us the ability to add circuitry to our quilts using conductive thread and LED lights. Did you know that one of the NASA astronauts made a quilt block while in zero gravity on the International Space Station? Click HERE to find out more about these fascinating concepts! BVQ meets on the second Tuesday of every month at 7PM** at the Bethlehem United Methodist Church, 4 Westown Rd, Thornton, PA.
Brandywine Valley Quilters cut with hope, stitch with grace, quilt with dreams, bind with laughter and share with love! Welcome to BVQ! Brandywine Valley Quilters was established in 1987 to pursue our members’ interest in quilting techniques and history, and to further our knowledge and gain experience in all aspects of the art of quilting. Our ﻿programs﻿ feature lectures by nationally-known or local quilt makers and teachers. We are involved in numerous Community Service projects, offer ﻿scholarships,﻿ and also make and raffle a quilt at our biennial quilt show to raise funds for educational and charitable purposes. Our monthly meetings are held on the second Tuesday of every month at the Bethlehem United Methodist Church, 4 Westtown Road, Thornton, PA, 19373 (see map below) starting at 7:00 PM. Fabric Raffles, Block Exchange, Block of the Month, 50/50 and Not-So-Blind Raffles are some of the activities we may enjoy. A break for refreshments and socializing follows, with “show and tell” and the evening’s program presentation beginning at 8:00 p.m. Doors open at 6:30 p.m. so come early to check in at our Welcome table and get settled in! *** Visitors: be sure to check our Speakers/Workshops page before coming to our meetings. Visitor fee varies with the speaker and sometimes (typically during the summer) we meet in a different location. *** A visitor may attend 3 meetings as a guest; then we hope that visitor will consider becoming a BVQ member! Depending on attendance, workshops may or may not be open to the public. This information will be indicated in the Workshop description. 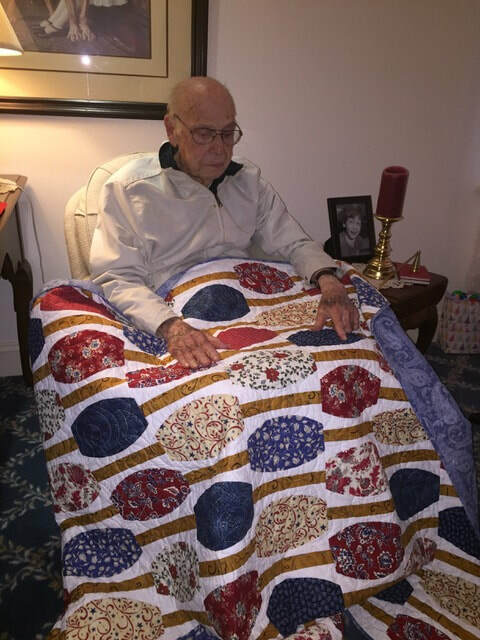 The recent Quilt of Valor was presented on December 16th, 2018 to 97 year old Army Tech Sargent Eldon S. Spaid. 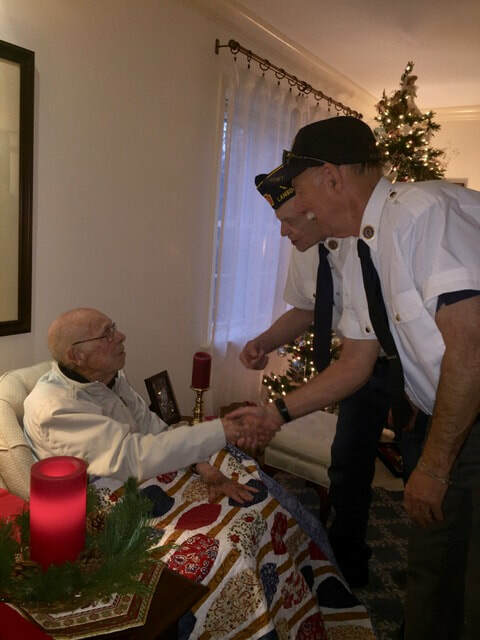 Mr. Eldon Spaid served in the Army from 6/24/43 to 3/9/46. Click on any picture to enlarge it. Quilts of Valor are needed! 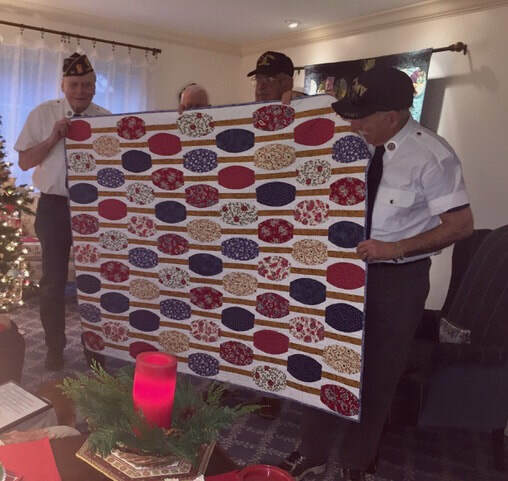 Click HERE to read about BVQ's involvement in The Quilts of Valor project.....and how YOU can help! Click HERE to see previous Quilt of Valor Recipients.